In a conference call with the Nevada GOP, the vulnerable red state Republican reportedly predicted Supreme Court nominee Brett Kavanaugh would be confirmed despite the recent assault allegation. 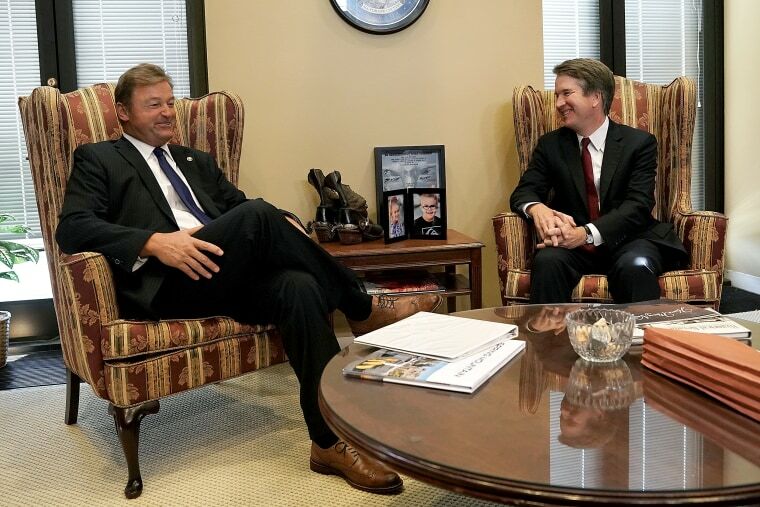 WASHINGTON — Sen. Dean Heller, R-Nev., said Thursday that his comment that the issues facing Supreme Court nominee Brett Kavanaugh over allegations of sexual assault were just a "hiccup" had been misinterpreted. "No, I do not believe sexual assault allegations of any kind are a hiccup, I was referring to how poorly the Democrats have handled this process and the fact that the Democrats have not worked with the Judiciary Committee Chairman in good faith," he said in a statement released by his Senate office. "I think it’s important for Dr. Ford to have the opportunity to share her story with the Judiciary Committee in public or private should she choose to do so. As I’ve said before, given the gravity of this appointment and this accusation, I would hope that all Senators, regardless of party, are willing to work with Chairman Grassley in good faith," he added. Heller, facing a tough reelection campaign against Rep. Jacky Rosen, D-Nev., made the original remark on a conference call with the Nevada Republican Party on Wednesday. The senator's comment came the day before before President Trump was expected to take the stage for a campaign rally with Heller in Las Vegas. The president was also expected to headline a fundraiser for Heller and congressional candidate Danny Tarkanian on Friday. The campaign of Heller’s Democratic challenger, Rep. Jacky Rosen, had attacked Heller’s “hiccup” comment, calling it dismissive of credible sexual assault allegations. The Cook Political Report rates the Nevada Senate race as a toss-up and recent polling suggests the contest is a statistical tie.